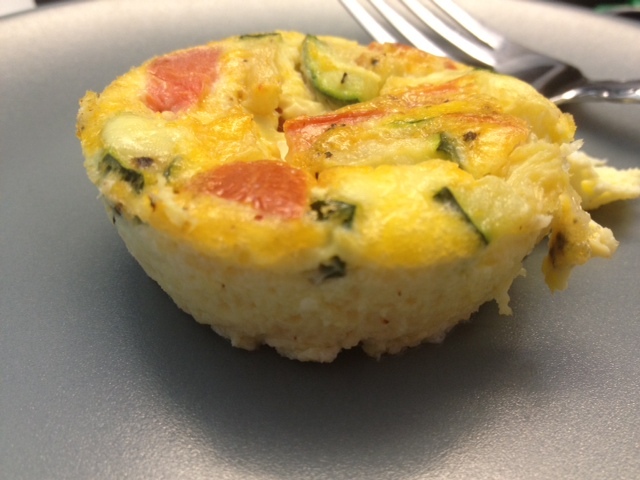 If it hasn’t been obvious from my past 10 or so posts, I’ve been really trying to find good, easy make-ahead breakfasts for weekdays. Part of that is that I’ve been trying to eat even healthier than normal to fit into a bridesmaid dress (and look good in my upcoming trip pictures). The other part is that my work schedule has been so crazy that I feel like normal meals have become non-existent. 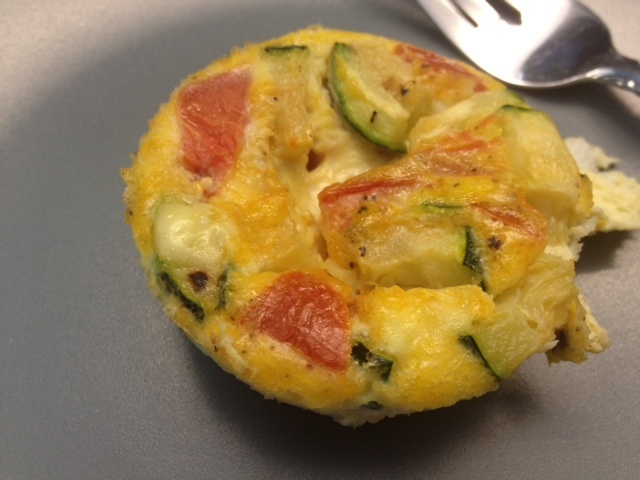 Enter the mini frittata. 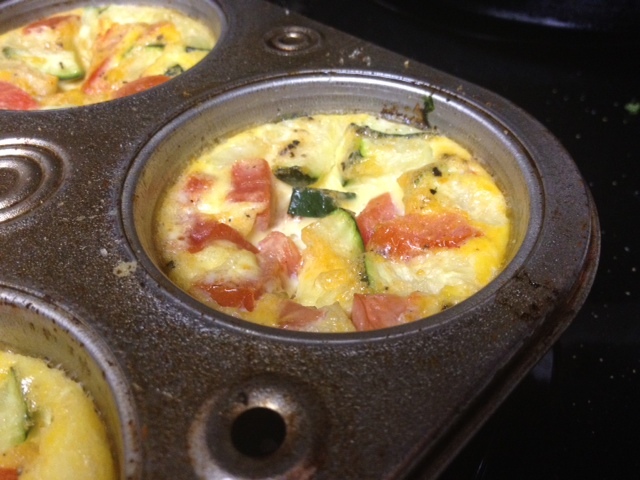 This was very similar to the kind of baked/oven poached eggs I did a few weeks ago. And just as easy. 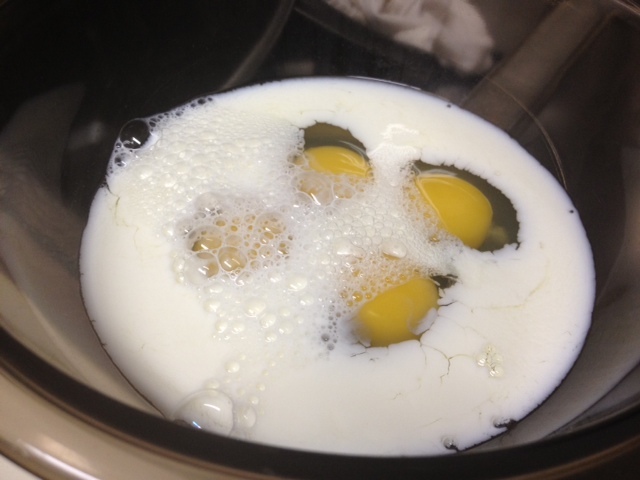 Break four eggs in a bowl and add some milk or half-and-half. I would normally only have skim on-hand, but I had some leftover 2% from my sister’s visit. Add the salt as well. 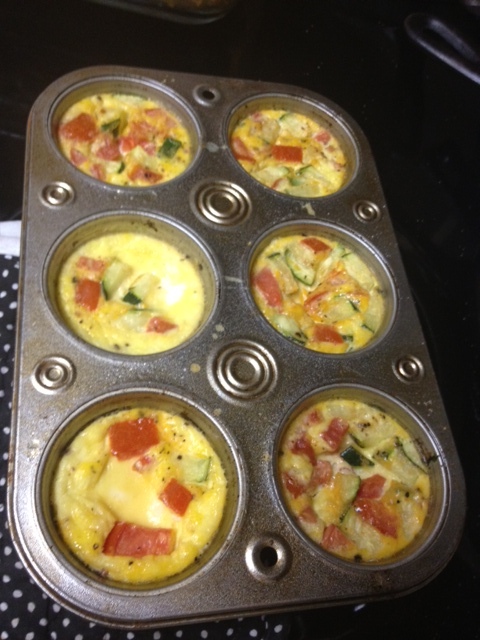 Spray a six-muffin tin with non-stick spray, then pour the egg mixture evenly into the cups. Add whatever you’d like to it—I had some sauteed zucchini, peppers, and tomatoes. You could even use some meat or cheese if you’d like. Season with pepper as well. 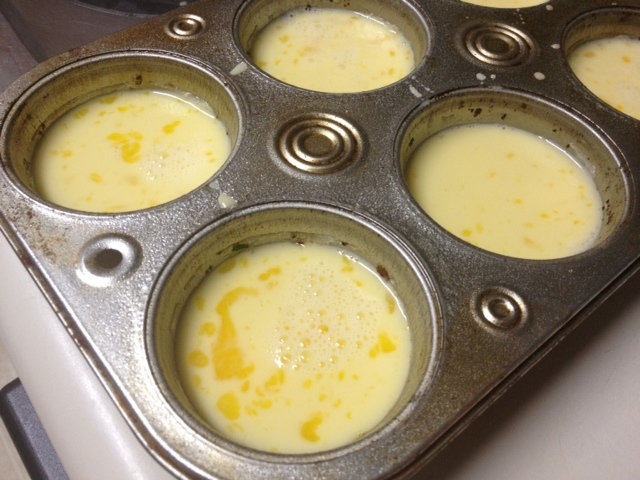 Bake for about 20-25 minutes, until the eggs are puffy and the sides are beginning to brown. And that’s pretty much all there is to it. Let cool awhile, then run a butter knife around the edge to loosen. I’d recommend using a small fork to lift out of the muffin tin, as mine tried to stick a little. They can be refrigerated and stored for up to a week, though I always get weird about eggs so I’d personally go maybe 4 days max. When you’re ready to eat in the morning, just reheat for 10-20 seconds. 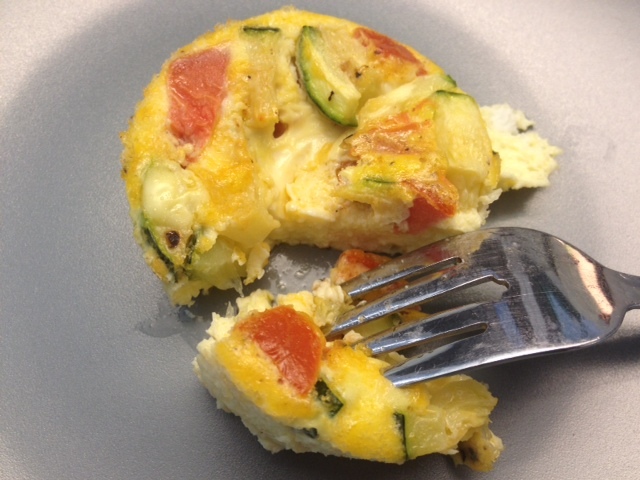 Great protein, a little veggie…all in all, a pretty good breakfast choice. 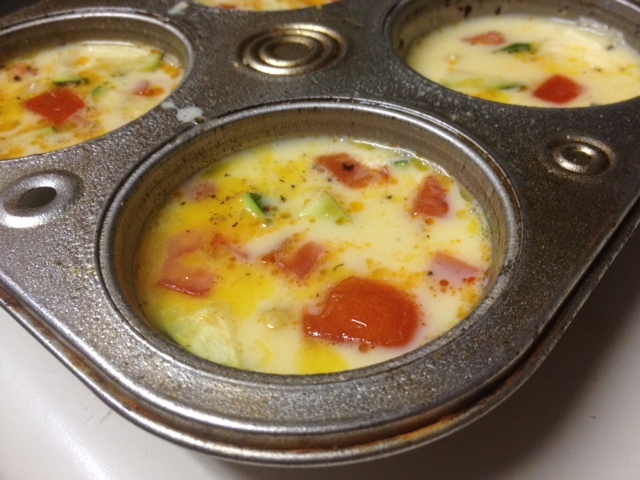 Heat oven to 350º F and coat a 6-cup muffin pan with nonstick cooking spray. Whisk together the eggs, half-and-half, and salt in a medium bowl, then evenly distribute the egg mixture among the muffin cups. Add a couple tablespoons of mix-ins to each cup, then sprinkle on a bit of Parmesan cheese if you like. Bake until they are puffy and the edges are golden brown, about 20 to 25 minutes. If necessary, run a butter knife around the edges to loosen before removing them from the pan. 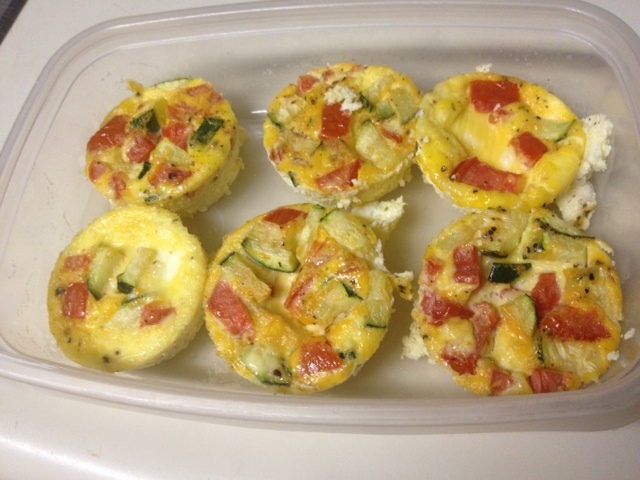 Makes 6 mini frittatas.